Another disappointing end to the season saw PSV Eindhoven come third in the Eredivisie, finishing behind champions Ajax and FC Twente. Although this was enough to secure qualification for the Europa League, things could have been so much better, as the Boeren (farmers) had led the table going into the winter break. Driven forward by the exploits of Hungarian Balázs Dzsudzsák and Swede Ola Toivenen, PSV were actually the league’s highest scorers, though this was assisted by the astonishing 10-0 demolition of old rivals Feyenoord. They also made reasonable progress in the Europa League, only being eliminated in the quarter-finals by Benfica. However, importantly, they once again missed out on qualifying for the lucrative Champions League – the third season in a row that PSV had failed to take their expected seat at Europe’s top table. This has had a dramatic impact on the club’s finances, as PSV had become accustomed to the regular infusion of UEFA money to boost their budget. Some might argue that this was foolish optimism, but in fairness the club did compete in the Champions League 12 years in succession between 1997 and 2008. This involved two elements: (a) strengthening the balance sheet with €80 million of additional capital, sourced primarily from the local council, but also involving contributions from Philips, other local companies and private individuals; (b) restructuring the profit and loss account by increasing income, mainly from sponsors, and making “significant cost savings”, including a salary cap and a reduction in overheads. As implied by the club’s name, Philips Sport Vereniging (Philips Sports Union), the electronics giant Philips has close ties with PSV. Indeed, the club started out in 1913 as a works team for employees of the conglomerate. Therefore, it was not overly surprising that Philips also came to the club’s aid, providing them with a €20 million loan, though given that the company is struggling itself, this was by no means a fait accompli. A further €10 million came from regional companies ASML and VDL Group, who each put in €5 million in the form of interest-free, 10-year subordinated loans. There have been some questions over whether the European Commission might rule against this deal as an effective subsidy, but surely they have bigger fish to fry at the moment. Indeed, such a deal is far from exclusive to PSV in the cash-strapped world of Dutch football. According to NOS TV, Dutch local authorities have invested over €300 million in football in the last five years through indirect subsidies, including loans to the likes of FC Utrecht, FC Groningen, FC Twente, Vitesse Arnhem and ADO Den Haag. "Wilfred Bouma - tattooed love boy"
Furthermore, there should be no cost to the city of Eindhoven, as the annual ground rent of €2.3 million will more than cover the €2 million interest that they have to pay on the loan they took out to finance the land purchase. If PSV were to go bankrupt, then the council would own the stadium. This just goes to show how quickly things can change in football. Although PSV have not matched their own high standards in the last three seasons, they have hardly collapsed, twice coming third and once fourth in the Eredivisie. However, everything is relative, especially for a team that had dominated the league in the previous decade, capturing the title seven times in a magical nine-year spell, including four years in a row between 2005 and 2008. They have also flourished in Europe until comparatively recently, reaching the semi-finals of the Champions League in 2005, before being unluckily eliminated by Milan on away goals after extra time, and the quarter-finals in 2007, when they were well beaten by eventual finalists Liverpool. Much of the blame for PSV’s fall from grace has been laid at the feet of former manager Huub Stevens, whose miserable reign ended in early 2009. His disciplinarian methods were rejected by the players, notably Mexican defender Carlos Salcido, who said that Stevens left him “dead mentally”, and he left the club as statistically the worst PSV manager since 1968. 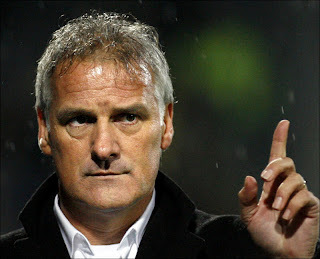 After a brief interim period, he was replaced by Fred Rutten, who had previously been Guus Hiddink’s assistant at the club between 2002 and 2006, before managing FC Twente with some success, though his subsequent experience at Schalke 04 was not so enjoyable. "Guus Hiddink - when you're young"
Hiddink, on the other hand, had been at the helm during PSV’s glory years. In his first spell, between 1987 and 1990, he led the team to three league titles, three Dutch cups and, most memorably, the European Cup in 1988, when PSV beat Benfica on penalties after a 0-0 draw. This was PSV’s first European success since defeating Bastia for the UEFA Cup in 1978. Curiously, the European Cup was claimed despite PSV failing to win any of their last five games in the tournament, as they eliminated Bordeaux and Real Madrid on away goals after four consecutive draws in the quarter-finals and semi-finals. Maybe that statistic is not too surprising, given that the team’s strength was its resilience, featuring tough competitors like Ronald Koeman, Eric Gerets, Søren Lerby and Wim Kieft. Hiddink was to return to PSV in 2002, when he shrugged off the saying that you should never go back, as this time round the club won another three league titles and a Dutch cup under his guidance. 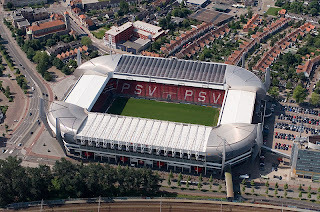 In fairness to their other coaches, PSV is the second most successful club in Dutch football history behind Ajax with 21 league titles and 8 cups, and is recognised for developing many great Dutch players over the years, such as Ruud Gullit, Gerald Vanenburg, Phillip Cocu, Jaap Stam and Ruud van Nistelrooy. "Celebrate good times - come on!" They also acquired a reputation for identifying bargains in under-scouted regions like South America. Under the influence of famed scout Piet de Visser, who worked for both PSV and Chelsea, the club bought two goalscoring phenomena in the Brazilians Romário and Ronaldo, but also ventured further afield to locate new talent, e.g. Jefferson Farfán (Peru), Carlos Salcido (Mexico) and Édison Méndez (Ecuador). This ability to spend the transfer budget wisely helped produce large gains when the players were later sold at a much higher price. Although the club’s supporters may not have appreciated players using PSV as a springboard to wealthier clubs, this “buy low, sell high” business model did help them to balance the books, allowing them to compete both domestically and internationally. However, two factors have damaged this profitable strategy: one impacted all clubs, but the other was self-inflicted. One basic economic rule is that if a company is successful, then sooner or later others will copy the approach. This has been the case in the transfer market, where other clubs now also actively scout places like South America, which has inevitably increased prices. In particular, this has reduced the competitive gap between the traditional big three in the Netherlands (Ajax, PSV and Feyenoord) and the other clubs, so that domestic victories can no longer be taken for granted. This had led to PSV abandoning their policy of buying young players to a certain extent, which has been detrimental to their progress. 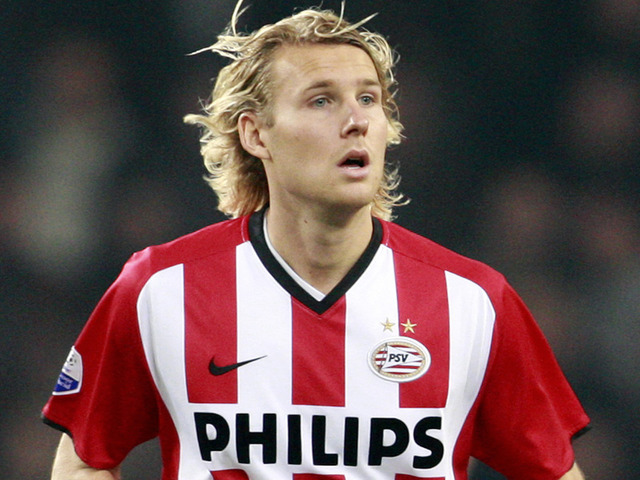 The other problem emanated from the arrival of a new general manager, Jan Reker, in 2007, whose catastrophic reign got off to the most inauspicious of starts when PSV were thrown out of the Dutch cup for fielding an ineligible player. More specifically, Reker’s desire to “clean house” led to the removal of the technical director Stan Valckx, who reportedly earned 5% on each outgoing transfer, and the Serb super-agent Vlado Lemic. As a result of the turbulence, de Visser also left. Although this might have made sense financially (and perhaps ethically), it meant that in one fell swoop PSV’s access to Lemic’s vast network of talented players was cut off. It also ended the club’s relationship with Chelsea, who had previously loaned them foreign players that were waiting for a British work permit, such as the defensive colossus Alex. That viewpoint is evidenced by the club’s financials, as four years of healthy profits came to an abrupt end in 2009/10, when they reported a thumping great loss of €17.5 million. That might not sound like a lot compared to some clubs in other countries, but it’s a huge amount relative to their turnover of around €50 million. PSV’s problem is obvious: while their costs have remained largely unchanged in the last three years, their revenue has plummeted from €85 million to €50 million. Their EBITDA (Earnings Before Interest, Tax, Depreciation and Amortisation) has been very impressive, though also on a reducing trend, but they have been hit by reasonably large non-cash expenses. In both 2007/08 and 2008/09, the results were to a certain extent held up by good profits on player sales, but this also fell last season. Another striking point is that interest payable is on the high side: at around €5 million, which represents an uncomfortable 10% of turnover. Essentially, the club had built its financial strength on money from the Champions League, most notably in 2007/08 when it made a significant profit of €29 million, though this was also boosted by the once-off sale of the parking lot for €8.5 million. However, its reserves have been rapidly depleting after a couple of years away from Europe’s flagship competition. Of course, PSV are not the only Dutch club to be toiling financially with the total losses for the Eredivisie rising to a record €90 million in 2009/10, excluding Vitesse Arnhem, whose accounts were delayed after the sale of the club, and VVV Venlo, who are an association, so don’t have to publish accounts. This compares to two years ago when the Dutch clubs made a joint profit of €64 million. However, the recession has taken its toll with lower TV rights and a downturn in sponsorships. In years gone by, clubs could make up shortfalls by selling players, but the Dutch transfer market is much diminished these days. In fact, only three of the 18 clubs in the Eredivisie made a profit in 2009/10: NEC Nijmegen €1.5 million, FC Twente €1.2 million and FC Groningen just €21,000. 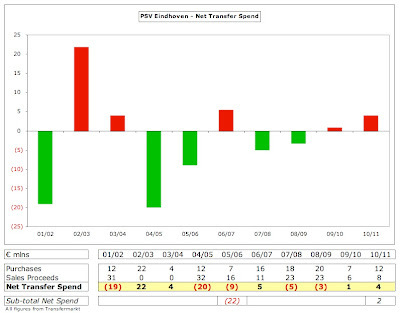 That said, PSV’s loss of €17.5 million was one of the worst, only surpassed by Ajax’s €22.8 million. PSV’s revenue decline of €35 million (or 40%) since 2008 is almost entirely due to television (€30 million), because of the lack of Champions League football. The decreases in commercial income of €3 million and gate receipts of €2 million in the same period are largely for the same reason. 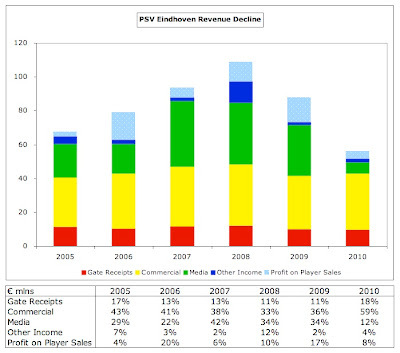 If we also consider profit on player sales as “revenue”, there has been a further fall of €7 million, while operating income has also shrunk by €11 million, due to once-off sales in 2008. 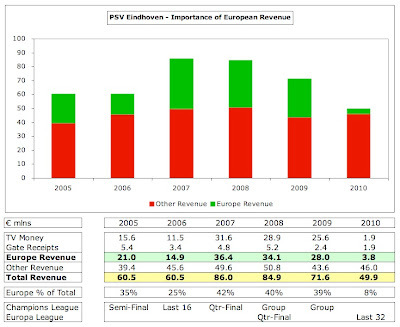 So, all in all, revenue at PSV has dropped by an astonishing €53 million (or 48%) since the record year of 2008. That’s a lot of money to compensate by cutting costs, but the reality is that costs have not reduced at all. No wonder that PSV hit the financial rocks. The major issue for the club has undoubtedly been missing out on the Champions League. In the last three years that they qualified, they received substantial funds, averaging €33 million a season (2007 €36 million, 2008 €29 million and 2009 €28 million), being a combination of TV money and gate receipts. With uplifts in sponsorships, the actual figure is even higher. In 2009, the club took in €2.4 million additional gate receipts plus €25.6 million from UEFA in TV money. This was made up of the €5.4 million participation fee given to all clubs, €0.6 million performance bonus for one win in the group stage and €19.6 million from the TV pool. The reason that the latter element was so high is that PSV were the only Dutch club represented, so scooped the entire Dutch pool. When this money had to be shared with Ajax in 2005 and 2006, the money distributed to each club was much lower. 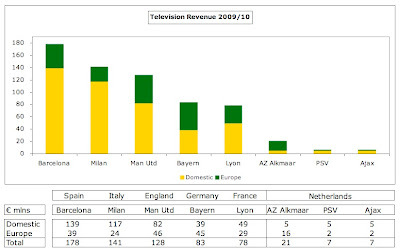 The difference with the money earned in the Europa League is significant, as can be seen in 2010, when PSV earned less than €4 million for their efforts, split evenly between TV and gate receipts. "All the way from Utrecht - Mertens and Strootman"
Money from the Champions League accounted for over 40% of PSV’s total revenue – an incredible statistic. While this might be the icing on the cake for leading clubs in other countries, it represents a substantial slice for clubs like PSV. In fact, the prize money for Champions League qualifiers is even higher now, though the Dutch TV pool might well fall, as Dutch broadcasters pay less and less for TV rights, while other countries are paying more. The other problem is that qualification has become more difficult, as investment by wealthy entrepreneurs in clubs like AZ Alkmaar and FC Twente have produced new challengers for domestic honours and indeed the coveted Champions League places. "Orlando Engelaar - can the big man deliver?" This was most clearly seen when PSV transferred promising midfielder Ibrahim Afellay to Barcelona for a bargain €3 million in the January transfer window, as they would have had to let him go on a free transfer in the summer. Interestingly, some have speculated that this transaction was rather short-sighted by the club, as they might have maintained their lead in the Eredivisie if they had kept one of their main driving forces, thus qualifying for the much more lucrative Champions League. Either way, it’s not entirely true that PSV cannot make good money from player sales any more, as demonstrated by last month’s sale of leading scorer Balázs Dzsudzsák to the ambitious Russian side Anzhi Makhachkala for €14 million. Similarly, PSV made good money in 2009, when selling Farfán to Schalke 04 for €10 million and Gomes to Tottenham for €9 million. Nevertheless, this is no longer the cash cow that it used to be for the Boeren (farmers), as seen by the feeble €4.2 million profit on player sales in 2010, mainly from the sale of Serbian forward Danko Lazović to Zenit Saint Petersburg. It is much more difficult these days to get young players to commit to long-term contracts, as they know that if they do not, then they are more attractive financially to the leading clubs. These are the ones that receive the real monetary benefit from a subsequent sale, as they do have the muscle to insist on long-term arrangements, e.g. Afellay signed a five-year contract with Barcelona. As we have seen, PSV’s biggest challenge comes from their low revenue, which can clearly be seen from a comparison with the Deloittes Money League. Although PSV have the second highest revenue in the Netherlands, only behind Ajax, they are miles behind the top 20 clubs, though the gap would obviously be smaller with the benefit of Champions League money. The bottom club in the Deloittes table, Aston Villa, earns more than twice as much revenue a season with €109 million, while Real Madrid, Barcelona and Manchester United generate over seven times as much revenue as PSV. That may be a spurious comparison, but what really emphasises PSV’s problem is that the team with the lowest revenue in the Premier League, Wigan Athletic, still earns more than them. Looking at PSV’s revenue mix, what is most striking is the extremely low television revenue of €7 million, which is feeble compared to the major leagues. If we compare that with the clubs that earn most from broadcasting income in those leagues, we can see that it’s less than 4% of Barcelona’s TV revenue, but it’s also miles behind the others. Of course, part of this shortfall is due to Europe, as PSV only received €1.9 million from the Europa League, while the others all earned at least €24 million from the Champions League. One reason why Champions League revenue is so important is the pitiful amount of money received from the domestic TV deal, which works out at around €5 million for PSV. 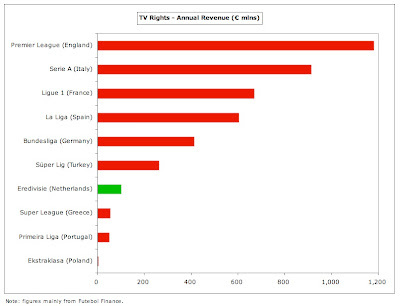 Although the Eredivisie has the seventh highest TV rights deal in Europe at €300 million for the three years 2008/09 to 2010/11, this is lower than the previous Tele2/Talpa deal and is a long way behind the largest leagues. At €100 million a season, it compares very unfavourably to others: England €1.2 billion, Italy €900 million, France €700 million, Spain €600 million, Germany €400 million, and Turkey €250 million. Media values are low in such a small country, as Michel van Praag, KNVB president, explained, “Holland is a country of 16 million people, while England, for example, is a country of 60 million. The difference in TV rights money the two leagues generate is huge and we can’t cope with the salaries our players are offered elsewhere.” To put this into context, West Ham finished rock bottom of last season’s Premier League, but still received around €45 million, which is nine times higher than PSV, who came third in the Dutch league. In fact, even teams in the Championship, the second tier of English football, receive more TV money than Holland’s highest level. Match day revenue is also extremely low at PSV with only €10 million in 2009/10, comprising €7 million season tickets and €3 million gate receipts (€1 million from domestic competitions, €2 million from Europe). This was virtually unchanged from the previous season, as ticket prices were not raised. Ajax’s match day income of €30 million is much higher, mainly thanks to corporate seating and executive boxes, though PSV might have classified such revenue in “Stadium Operations”, which I have wholly included in commercial revenue. Either way, there’s no doubt that leading clubs from other countries also possess a significant competitive advantage in this revenue stream with Real Madrid, Barcelona, Manchester United and Arsenal all generating at least ten times as much revenue as PSV. Even the Italian clubs that are notorious for not maximizing the revenue opportunity from their grounds like Roma and Juventus earn nearly twice as much here. 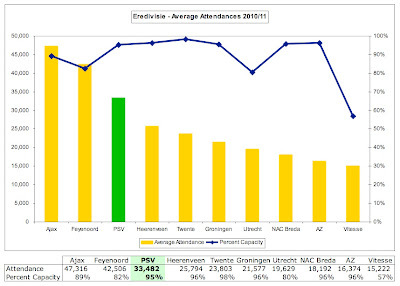 Nevertheless, PSV’s average attendance of 33,482 in the 2010/11 season was quite impressive, being the third highest in Holland behind Ajax and Feyenoord, and filling 95% of the stadium capacity of 35,119. In fact, their attendance in 2009/10 was the 45th highest in Europe ahead of such luminaries as Porto, Paris Saint-Germain, Bayer Leverkusen and Bordeaux. The Philips Stadium has some nice touches: not only are all the seats covered and heated, but it also features the singular attraction of a Michelin-starred restaurant called “Avant Garde”. It has been used to stage many events, including the 2006 UEFA Cup final between Sevilla and Middlesbrough and numerous music concerts. However, any plans to expand the capacity to 45,000 have been put on hold, following the failure of the joint Dutch/Belgian bids to host the 2018 or 2022 World Cups. Furthermore, the deal whereby the council bought the land under the stadium stipulated that the club could not increase the capacity in the near future. The club’s commercial arm has been doing pretty well at €33 million, comprising sponsoring of €13 million, merchandising €3 million and stadium operations €16 million. The most important sponsor is unsurprisingly Philips, who have been the club’s shirt sponsors since the Dutch authorities first allowed such deals in 1982. That unbroken relationship is unique in Holland and the deal was extended earlier in March for a further five years until July 2016 at €5 million a year, which bears comparison with all but the largest sponsorship deals. In addition, PSV have taken a second shirt sponsor, De Lage Landen, a global provider of asset-based financing products, who signed a three-year sponsorship deal worth €4 million, so €1.3 million a year. The logo of Freo, the company’s online label, will appear on the back of the PSV shirts from this season. PSV also enjoy another long-term relationship with Nike, who have been the club’s kit supplier since 1995. The current six-year deal runs from 2009 to 2015 and is worth around €5 million a year. The club has numerous other official partners, including Mercedes-Benz, Rabobank and Bavaria beer. Merchandising sales improved after the club brought its FANstore in-house in 2007, locating the 800 m2 facility at the stadium. 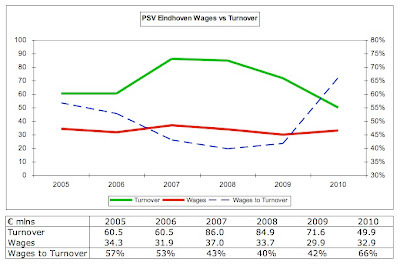 PSV’s inability to cut their cloth according to their means is epitomised by their wage bill, which has stubbornly remained at around €33 million the past three years while revenue has dropped from €85 million to €50 million, causing the wages to turnover ratio to rise from a very respectable to 40% to a worrying 66%, approaching UEFA’s recommended upper limit of 70%. In fairness, this is not an inordinately high wage bill, e.g. it is a lot lower than Ajax’s €49 million, which makes it difficult for PSV to compete with the higher salaries at other clubs. As an example, when Afellay was transferred to Barcelona, he arrived at a club whose wage bill is an astonishing €235 million. 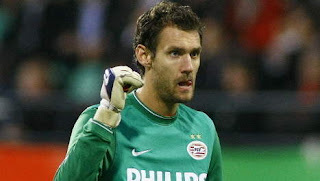 However, the reality is that PSV’s wages can only be supported if the club is in the Champions League. Therefore, as part of the recent financial restructuring, the club said that it would reduce the players’ wage bill by €4 million and save another €4 million by cutting 14 jobs in other departments. Much of this may well have already been achieved through the departure of players on relatively high wages like Dzsudzsák, Afellay, Ooijer, Koevermans, Salcido and Kromkamp. Bonus schemes have also been adjusted to be more in line with performance and thus revenue. "Ibrahim Afellay - one that got away"
This is part of a new hair shirt policy, as explained by the technical director Marcel Brands, “We will only play over €1 million for an exceptional player, which automatically means you won’t have 10 players in your team like that.” He did, however, also warn that this meant that PSV would no longer be in the market for experienced, international players. In much the same way, the club’s non-cash expenses of €20 million do not appear to be too high at first glance, but are clearly too much for the budget to bear. Player amortisation, the annual charge of writing-down the cost of transfer fees, is around €12 million, but the club also regularly assess the value of players on its books, resulting in impairment charges of at least €3 million. Depreciation on fixed assets is also fairly chunky at €5 million (Ajax is only €1.5 million). Although transfer fees are not expensed immediately, player amortisation will feed through into the accounts, e.g. Georginio Wijnaldum was bought from Feyenoord for €5 million on a four-year contract, so his amortisation will be €1.25 million a year (€5 million divided by four years). One implication of player amortisation remaining more or less at the same level is limited activity in the transfer market, which is indeed the case, as there has only been €2 million net spend over the last five years. However, the point here is that PSV used to make more money through selling players, as can be seen by the net sales proceeds of €22 million in the preceding five years. 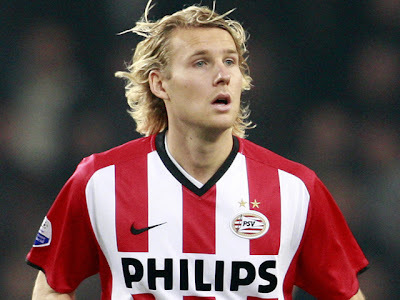 PSV have also been hit by high interest charges, due to an onerous repayment schedule for their loans. In the last six years, they have had to pay €41 million, including €4.5 million in 2009/10. This is another area where the restructuring plan will help the club, as the new money will be used to pay off expensive loans, leading to a net saving of €2 million a year on the stadium financing. 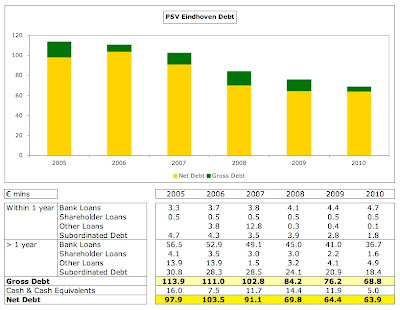 The need to restructure is underlined by PSV’s debt. Although the club has been steadily lowering the debt levels with gross debt being cut from €114 million to €69 million in five years, this paradoxically highlights the nature of their problem, as the repayment schedule was quite aggressive. Most of the debt comprises bank loans of €41 million, which are repayable in 7.5 years at Euribor + 1.75%, while there are also subordinated loans of €20 million: about €15 million of these bore interest at 8% and were repayable by 2020, while the remaining €5 million carried interest at Euribor + 2% and were repaid with 15% of net proceeds from player sales. So, even though PSV’s cash flow was reduced, as their revenue fell, they still had to find the money to repay large slices of their loans and pay high interest charges. This has now been addressed as a result of the financial restructuring plan. Indeed, one of the conditions for the council’s support was that their money could only be used to pay off this debt. The cash flow statement clearly demonstrates the scale of the challenge, as the club needed to make repayments of around €9 million a year, which was perfectly manageable when the cash from operating activities was over €25 million a year, but was problematic when this dropped to just €3 million in 2009/10. Indeed, the net cash outflow of €7 million last year would have been even higher without taking on a new loan of €3 million. Nevertheless, the balance sheet looks fairly solid, even though the players net book value is only €19 million, which is much lower than the market value if they were sold (estimated at €68 million by the respected website Transfermarkt). In addition, the land and buildings are valued at €65 million. The problem, of course, is that this money can only be realised via selling the assets, which might be a little short-sighted for a football club. 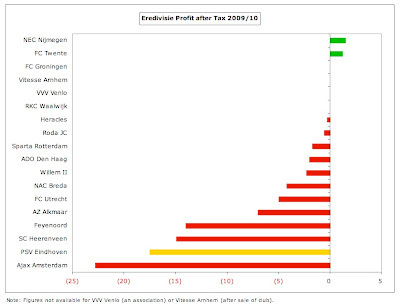 Of course, PSV are by no means the only club that is struggling financially in Holland. In fact, according to a report by the KNVB, they are just one of the 19 professional clubs that “need to take action”, a list which also includes Ajax. However, it’s even worse for the 13 clubs that are “in the danger zone”, including Feyenoord, who must balance their books within three years or risk losing their licence. Only four clubs are deemed to be “financially secure”: Go Ahead Eagles, FC Twente, Telstar and FC Volendam. "Andreas Isaksson's thousand yard stare"
It may be that the Dutch authorities demand more fiscal responsibility than their counterparts in other countries, but there is clearly a structural problem in Holland, leading to suggestions to form a so-called Atlantic league, featuring clubs from Holland, Belgium, Sweden, Denmark and Scotland, or even a merger between the Dutch and Belgian leagues. PSV’s media spokesman, Pedro Salazar Hewitt cautiously welcomed such initiatives, “We will always be open for creating a new situation”, but most fans seem to be against changing the status quo. In any case, it is debatable whether such a move would boost revenue sufficiently to challenge the major leagues, even though the market size would increase and presumably lead to more money from the sale of TV rights. Another inducement for PSV to get its financial house in order is the advent of UEFA’s Financial Fair Play regulations, whereby clubs need to break-even before being allowed to compete in Europe. This was reinforced last month by the KNVB, who warned that clubs on their watch list because of poor finances would not be permitted to play in European competition from the 2012/13 season. 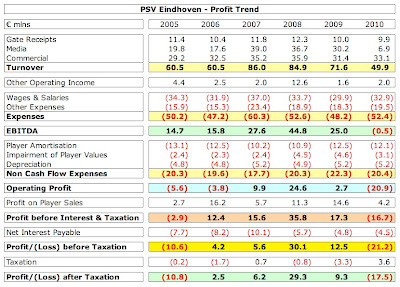 PSV’s next accounts for the 2010/11 season will still reflect their “structural deficit”, as revenue will be about the same level, and the loss is likely to be at least as much as last time at €17.5 million, though some have suggested that it could be as high as €30 million. "Balázs Dzsudzsák - Stay Hungary"
On the bright side, improvements can be anticipated for the following season. Not only will the profit on player sales be boosted by the Dzsudzsák sale, but the club has also pledged to improve the bottom line by €20 million by increasing revenue by €10 million and cutting costs by the same amount. That would mean that the club would be profitable even without the benefit of the Champions League, which was one of the conditions imposed by the council in exchange for their funding. In addition, the club could also make more money by selling the likes of striker Ola Toivenen, who interested Liverpool last season and would fetch around €8 million, or goalkeeper Andreas Isaksson, worth €5 million. Under Brands, PSV also intends to focus far more on youth development, as opposed to buying in older, more expensive players. He said, “We need a squad of 19 players and we want four to five youthful prospects in there.” There is some evidence that this is already happening with the emergence of Zakaria Labyad, Género Zeefuik and Stijn Wuytens. Of course, most other Dutch clubs are applying a similar policy these days, so PSV need to show that they will give youngsters a chance if they are to attract the best talents. "Zakaria Labyad - here's to future days"
However, Brands also highlighted the club’s dilemma when discussing the previous regime, “It’s about ambition. PSV wanted to remain at Champions League level and needed to invest in top quality to achieve this. 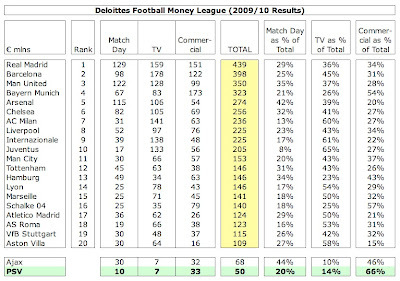 The bigger the club, the bigger the ambitions, the bigger the bills.” The change in attitude since then was stressed by general manager Tiny Sanders, “All clubs have to face the new reality of giving priority to sustainable financial health.” That does not necessarily mean that PSV will no longer be able to challenge, as the recent history of the Eredivisie proves that money does not guarantee success with outsiders FC Twente and AZ Alkmaar victorious in the last three years. The reality is that PSV have often managed to outperform given their limited resources, so much so that the eminent Dutch journalist Simon Kuper once called them “the best little football club in Europe.” In truth, it’s remarkable that PSV were able to compete at the highest European levels for so long. "Only four clubs are deemed to be “financially secure”: Go Ahead Eagles, SC Heerenveen, Telstar and FC Volendam." This is not true. Heerenveen isn't financially secure. They are in categorie 2. FC Twente is, together with Go Ahead Eagles, Volendam and Telstar financially secure. If you could provide me with a link with different information, I would happily update/correct. In july 2011 Heerenveen was not in the financial top flight any more. Your source, Swiss, is from august 2010. Heerenveen, by the way, is an excellent example of a club with a buying low, selling high strategy, with the likes of Van Nistelrooy (to PSV), Huntelaar and Suleymani (to Ajax), Alfonso Alves and Samaras to the Premier League, Pranjic to Bayern. Kuper and Scymanski mentioned this little club in their Moneyball equivalent. One time eredivisie runners up, several Uefa Cup attendances. The chairman quit after 20 years and the money is now spent. PSV of course plays at a different level. I think you hit the right button in your last paragraph, PSV outperformed for a long time (and didn't prepare for other times). Guus Hiddink used to say he'd like to buy at Champions League level. He got away with the high costs because he won them titles. Having to sell the parking lot, with also the places of the big chiefs, including former Philips CEO Timmer, opened their eyes, and they appointed Jan Reker to do the cleaning of the house. It was PSV's chairman during the successful times Van Raaij who long ago proposed an Atlantic League, including Portugal, also a football country with some quality clubs who like to play (and thus pay) at the top level but have to deal with a small commercial market, as you've pointed out in your Porto and Ajax analyses. A last word, characterizing PSV's CL ambition while being a provincial, or Boeren, club: with their first entrance in the CL, their program mentioned "Champignons League". OK, thanks. I've now edited and corrected that sentence. As a Dutch Ajax fan I would love to see an Atlantic League. Ajax v Anderlecht, Ajax v Rangers. Sounds good to me, plus more money. I dont know why others are against. Off topic: the idea of an Atlantic League might already be a bit old-fashioned in itself, seeing last years Europa League's last 16 filled with the top clubs from Portugal (3), Holland (3) and Russia (3), and also Scotland (1) and Ukraine (1). The other five were non-top clubs from England, Germany, France and Spain. Now, we all know that Nato is in search for a new future for itself, but Russia might not be part of that for the next few years. So the name Europa League might prevail for that Atlantic competition. Rumors have it that Europe’s top teams are thinking of forming a new competition when the Champions League contract expires in 2014. The others will a) be hoping for an invitation (Porto, Ajax) or b) thinking of forming their own league. "Hiddink, on the other hand, had been at the helm during PSV’s glory years. In his first spell, between 1987 and 1990, he led the team to three league titles, three Dutch cups and, most memorably, the European Cup in 1998, when PSV beat Benfica on penalties after a 0-0 draw." Ah, thanks for that. Typo now corrected, though it's actually 1988. Problem with getting an Atlantic League going is that only a handful of Dutch clubs would be able to enter it (PSV, Ajax, Twente, AZ and maybe Feyenoord) - it will completely destroy TV revenues, gate receipts and commercial income for the remaining clubs. So the five big clubs find themselves outvoted every time. It's interesting that a Portugese club like Porto does so much better both on the pitch and in the books than Ajax, PSV and Feyenoord, while they face the exact same issues (smaller country, even less tv money) and run similar sized budgets. It seems that it's not completely impossible to make money as a feeder club in a small league. The Portugese top teams have the advantage of having a big network available to them in South-America. Back in the day it was not as common to sign players from South-America and PSV could sign incredible talents like Ronaldo and Romario. That would be unheard of today. However there is still a big range of talents available to the Portugese clubs. All those talents are far more likely to sign for a Portugese club because of the climate there as well as the language. Look at the big sales teams like Benfica and FC Porto have made over the recent years.